The structure of a mammalian kidney is parsed into large collections of polarized nephrons, and each segment is home to a diverse community of cells that specialize in renal endocrine and excretory functions. Early developmental lengthening and diversification of nephron segments along a proximal-–distal axis initiate all subsequent facets of tubular growth and function. Morphogenic cues and biochemical interactions that are critical to this process are starting to emerge. The underlying principles of regional cell signaling and transcriptional control organizing early segmentation are the subject of this review. Of all of the events that lead to the formation of a functioning kidney, early segmentation of developing nephrons is perhaps most crucial to successful organogenesis. Each nephron comprises a glomerular filter followed by various tubular segments that are specialized for reabsorption and secretion of solutes and water. All components of the developing nephron derive from different regions along the proximal–distal axis of primitive cell aggregates called the renal vesicle. The sequential timing of lineage-dependent transcription factors and signaling pathways establishes the characteristic structure and function of each segment. Nephron development can be linked and understood by examining several discrete events. These events include the organization of the metanephric blastema via a reciprocal ureteric bud-metanephric mesenchyme interaction, segregation of cell types by differential adhesion, and the regional engagement of specialized transcription factors. The molecular basis of this reciprocal process has been reviewed extensively elsewhere1–3; we focus here on aspects that pertain to nephron segmentation, or the process through which regional identities emerge. Proper segmentation of the renal vesicle is critical to all specialization that follows. The ureteric bud, an epithelial outgrowth from the Wolffian duct, instructs the metanephric mesenchyme to undergo mesenchymal-to-epithelial transition. This mesenchyme in turn induces the ureteric bud to branch. Each branch tip again induces mesenchymal-to-epithelial transitions, and this continues until a species-appropriate number of nephrons complete a mammalian kidney. Because the kidney expands as a sphere from a central starting point, we consider the center to peripheral axis as the proximal–distal axis in describing the relative position of emerging structures within the metanephric mesenchyme. In this way, peripheral structures become distal and closer to the cortex than to the medulla. Developmental biologists recognize three primitive stages that form the nephrogenic body during development: The renal vesicle, the comma-shaped body, and the S-shaped body. Nascent epithelial structures always appear on the proximal side of the ureteric bud tip, and their own proximal–distal axis remains aligned, with the duct tip marking the distal end. Proximal–distal polarity within nascent nephrogenic bodies is morphologically apparent in the comma-shaped body. This stereotypical structure forms because the first cells to elongate, change shape, and form a “slit” are located at the proximal end, farthest from the ureteric bud.4 Proliferation and differential adhesion may be the drivers that contort the comma-shaped body into an S-shaped structure that fuses at its distal end with the ureteric bud while podocyte precursors emerge at its most proximal end.4 The epithelial precursors for three nephron segments (glomerulus, proximal tubule, and distal tubule) all can be identified within the S-shaped body using several molecular markers, including Pax2, WT-1, Jag1, Cdh6, and E-cadherin.2 The molecular basis for this asymmetry creates a structural polarity. Is polarization of a nascent nephron along the proximal–distal axis intrinsic to the developing nephron, or is it dependent on signals from the ureteric bud, or both? Isolated metanephric mesenchyme fails to form epithelia, but it can be induced to do so by a signaling source such as ectopic ureteric bud or spinal cord. Using this system, Saxen4 and others speculated that differentiation of tubular structures along the proximal–distal axis requires ureteric bud signals, is sequential, and perhaps is interdependent. The most proximal elements, the glomerulus and the proximal tubule, appear shortly after induction, whereas all three nephron segments, including the distal tubule, form only when exposure to an inducer source is longer than 24 h. In this way, the metanephric mesenchyme resembles other tissues that respond to morphogenic gradients (e.g., activin,5,6 wingless7,8). The response to the morphogen depends on the distance of the morphogen source from the responding cell with a low concentration-dependent response occurring earlier or at a greater distance from the source than a high-concentration one, and the higher concentration event inhibiting or replacing the earlier fates, thus generating a proximal–distal axis. Experimentally, ureteric bud or spinal cord inducing mesenchymal-to-epithelial transitions can be replaced by several Wnt molecules9,10 or by transient exposure to GSK3β inhibitors,11 suggesting that Wnt signals likely induce mesenchymal-to-epithelial transition by increasing the half-life of β-catenin. Indeed, ectopic stabilization of β-catenin in the metanephric mesenchyme triggers conversion to epithelial structures.11 The endogenous ureteric bud signal is most likely Wnt9b. Nephrogenesis arrests in Wnt9b−/− embryos after the ureteric bud invades the blastema and the kidney fails to form (Figure 1, A and B).12 Thus, the Wnt signal is both sufficient and required for induction of pretubular mesenchymal aggregates.12 Because Wnt9b (and its target Wnt4) can induce a distal marker, Lhx1,13 in the renal vesicle, an early Wnt gradient may provide a polarizing signal. Cells that are near the source will express Lhx1, a distal marker, whereas cells that are farther away (exposed to lower morphogen concentrations) will be the first to elongate and later acquire fates for the proximal tubule and glomerular podocytes. This is consistent with short exposure to the morphogen producing the proximal tubule/podocyte precursors. As is detailed later, Lhx1 is required but not sufficient to secure proper segmentation of the nephron. Schematic summary of expected and observed results from genetic manipulation of the metanephros. (A) Wild-type renal vesicle acquires a proximal identity first and has a stereotypical position relative to the ureteric bud. (B) Without Wnt9b, no renal vesicle develops. (C through F). Although a greater sample needs to be analyzed, Six2−/− mice permit discrimination between several mechanistic possibilities. Hypothetically, in the absence of Six2, all metanephric mesenchyme cells could respond to Wnt9b and convert to an epithelial structure (C; Six2−/−1), but, in reality, only a subset form ectopic renal vesicle with regular spacing between them (D; Six2−/−2). In addition, the distal ends of the ectopic vesicles are almost always closer to the ureteric bud, suggesting that a signal from the ureteric bud polarizes the vesicles along the proximal/distal axis. (E) In theory, if a global patterning cue existed, then all ectopic renal vesicles should align to the field (as in Six2−/−3), but this is not the case in the Six2−/− metanephros. (F) Another possibility is that only the proximal ureteric bud organizes the renal vesicle along the proximal–distal axis, or the proximal–distal segmentation program is an intrinsic renal vesicle property that does not require external cues. In both of these cases, randomized proximal–distal acquisition is expected (Six2−/−4). (G through I) Polarization defects in Lhx1, Notch2, and NICD1 mutants. Note that overexpression of activated Notch1 differs from loss of Six2 in that it results in multiple, poorly spaced proximal epithelial clusters. Wnt9b is expressed in the Wolffian duct, the ureteric bud, and the collecting system.12 Given its broad expression pattern, it was unclear until recently how mesenchymal-to-epithelial transition is limited only to the proximal aspect of the branch bud tip. Mice that are deficient in the homeobox gene Six2 sprout epithelial aggregates both proximal and distal to branches in the ureteric bud (Figure 1C).14 Thus, Six2 must either prevent mesenchymal-to-epithelial transition distally, perhaps by antagonizing the effects of Wnt signaling,14 or Wnt9b may reverse an inhibitory influence of Six2 on epithelialization in response to other inducers. Either way, Six2 maintains mesenchyme cells in an undifferentiated state. Once formed by bud induction, the cellular aggregates that become epithelial also synthesize Wnt4 and no longer require Wnt9b. Wnt4 expression begins in the renal vesicle, becoming restricted to the distal portion of the S-shaped body.17 This observation is consistent with Wnt concentration being highest at the distal end, acting to organize the early proximal–distal axis. Genetic inactivation of Wnt4 in mice results in severely hypoplastic kidneys accompanied by limited branching of the ureteric bud. Although N-myc is still present in the metanephric mesenchyme and the Wnt targets Pax8 and FGF8 are still detectable in the ureteric bud, the renal vesicle markers N-myc, Pax8, FGF8, and Lhx1 (or Lim1) are either lost shortly after renal vesicle formation or absent entirely.12,17 This indicates that Wnt9b alone is not sufficient, and, as Saxen's reconstitution experiments show, sustained exposure to Wnt is required to complete segmentation, which is also reminiscent of animal cap induction by activin.5,6 Although Wnt4 and Wnt9b are capable of inducing the formation of renal vesicles and tubulogenesis in isolated metanephric mesenchyme, Wnt9b fails to induce differentiation in Wnt4−/− metanephric mesenchyme, whereas Wnt4 can induce Wnt9b−/− mesenchyme to form tubular structures.12 These studies support a model in which bud-derived Wnt9b, in a paracrine manner and in opposition to Six2, induces Pax8, FGF8, and Wnt4 gene expression. Wnt4 then acts in an autocrine manner within pretubular vesicles to maintain Pax8 and FGF8 and to activate Lhx1 not only to promote epithelialization but also to polarize the renal vesicles. The segregation of cells into proximal and distal domains within the renal vesicle may be assisted by differential expression of the cell adhesion molecules E-cadherin (distal) and cadherin-6 (proximal).18 In Six2−/− kidneys, the expression domains of E-cadherin and cadherin-6 are abnormally expanded, overlapping each other extensively within ectopic renal vesicles. This suggests that polarization of renal vesicles is not entirely an intrinsic property of the nascent epithelium at this stage or that distally, Six2−/− aggregates are exposed to a different signaling environment than those located proximally. Alternatively, Six2−/− aggregates suffer from other intrinsic defects; that is, ureteric bud signals may be altered when the metanephric mesenchyme is ablated, or the metanephric mesenchyme itself may contribute to the proper polarization of renal epithelia. Whichever the case, it is apparent that the location of the renal vesicle relative to signals that emanate from the ureteric bud critically contributes to the establishment of a proper proximal–distal axis within the renal vesicle, in addition to promoting epithelialization of the metanephric mesenchyme. In wild-type kidneys, the S-shaped body maintains the segregation of a distal E-cadherin+ domain with a medial cadherin-6+ region that contains proximal tubule precursors. The glomerular/podocyte precursors do not express cadherin-6, indicative of the emergence of yet another domain within the S-shaped body. The expression of E-cadherin in the ureteric bud and the distal portion of the renal tubule likely facilitates fusion between the two.18 Mice that are deficient for cadherin-6 are viable and fertile19; however, epithelialization of the renal vesicle is delayed—that is, neonates have some necrotic glomeruli and adults have reduced nephron number, indicating a role for this molecule in nephrogenesis. In addition to Lhx1, a homeobox transcription factor, polarized expression patterns of genes that encode other transcription factors are evident within the renal vesicle. This suggests that renal vesicle cells are not equivalent, and these additional factors are likely to mediate the differentiation of distal versus the proximal elements within the renal vesicle. Lhx1 induces the expression of Brn1, a POU domain–containing transcription factor, in the distal domain of the renal vesicle and subsequently in the distal portion of the S-shaped body.13,20 Genetic inactivation of Brn-1 in mice results in postnatal lethality within the first 48 h after birth as a result of renal insufficiency. Brn1−/− kidneys develop a normal number of mature glomeruli and proximal tubules but display a dramatic reduction in numbers of mature loops of Henle, macula densa, and distal convoluted tubules. Nephron development in these mice is arrested at a primitive stage before the loops of Henle elongate. Brn-1 is thus a transcription factor that specifies the distal domain within the renal vesicle and subsequently contributes to differentiation of distal derivatives. Conditional inactivation of Lhx1 in the metanephric mesenchyme results in the formation of renal vesicles that express Wnt4, Pax8, and FGF8 but lack the distal-specifying factor Brn-1. They also lack Delta-like-1 (Dll1) expression, a distally restricted Notch ligand. The failure of Lhx1−/− renal vesicles to regionalize along the proximal–distal axis arrests nephron development at this stage and does not allow for the polarized elongation of the vesicles into comma-shaped bodies (Figure 1G). In chimera experiments, Lhx1−/− embryonic stem cells initially contribute to the entire renal vesicle but later are excluded from the distal region. In S-shaped bodies, where at least three distinct molecular domains are evident, Lhx1−/− cells could contribute only to the precursors of Bowman's capsule and podocytes, consistent with the importance of Lhx1 and Brn-1 in distal fate acquisition. Lhx1 thus acts downstream of the organizer signal, is required for distal domain specification within the renal vesicle, and may function later to specify the proximal domain of the S-shaped bodies along with Notch, as we detail next. A number of studies implicate Notch signaling in segmentation of the nephron. The asymmetric expression of the Notch ligand Dll1 in the distal domain of the renal vesicle and its persistence in the medial portion of the S-shaped bodies and the enrichment of Notch signaling components and targets in the proximal domain of the S-shaped bodies21–25 raise the possibility that Notch signaling is involved in nephron segmentation. Mammals express four different Notch genes, Notch 1 to 4, all of which are type I transmembrane proteins with an extracellular ligand-binding domain and an intracellular domain that regulates transcription. Notch1 and Notch2 are expressed in renal epithelial cells. Notch receptors participate in essential, short-range, signal transduction pathways that are used during development to help cells select one of several future options by altering the transcriptional landscape in cells that experience Notch activation. Signaling is initiated when ligand binding induces ectodomain shedding of Notch, which is followed by intramembrane cleavage, mediated by the enzyme γ-secretase, to release the Notch intracellular domain (NICD). All NICDs translocate to the nucleus to affect transcription through one protein, the transcription factor RBP-J.26 Under basal conditions, RBP-J functions as a transcriptional repressor, but upon complex formation with NICD, it is converted transiently to an activator through the recruitment of additional co-factors and the transcriptional machinery.27 The discovery that cleaved, intracellular domains of Notch1 (NICD1) are present in renal vesicles and the S-shaped bodies indicates that Notch1 is activated early in nephrogenesis and prompted investigators to pharmacologically block Notch signaling with γ-secretase inhibitors (GSI).28 A GSI-sensitive window was discovered early in nephrogenesis, opening after initial mesenchymal-to-epithelial transition and closing as the S-shape body forms. When exposed to the drug28 or deprived of γ-secretase components genetically,29 metanephric mesenchyme produces nephrons that lack glomeruli, proximal tubules, and loops of Henle but contain distal tubules that correctly fused to the collecting duct.16 It is interesting that inactivation of Lhx1 results in loss of Dll1, and Dll1 hypomorphic animals have a severe reduction in nephron numbers accompanied by loss of proximal segments.16 This finding is consistent with the assumption that Dll1 is the first Notch ligand to act in the renal vesicle. After loss of Lhx1, at least three other Notch signaling components, jagged-1 (Jag1), hairy and enhancer of split 5 (Hes5), and musashi homolog2 (Msi2), fail to appear.30 These results indicate that Notch signaling plays a role in nephron segmentation, alone or in conjunction with other γ-secretase substrates. Further dissection of the Notch pathway reveals that removal of the receptor Notch2 is sufficient to mimic the full effect of GSI or γ-secretase inactivation, confirming that Notch signaling is indeed critical for nephron segmentation and permitting detailed analysis of its role in this process. Importantly, renal vesicles that are deficient in Notch2 attain the normal, distally restricted expression of Lhx1, demonstrating that the initial proximal–distal axis is correctly specified upstream of Notch2 and independent of it. Similar results are seen when RBP-J is removed but not when Notch1 is lost. This observation explains why Alagille syndrome occurs in humans who lack one copy of Notch231; Notch1 simply cannot do the job. Given that Notch1 can activate RBP-J effectively,32 understanding how to reinvigorate Notch1 in human kidneys may provide a key to the treatment of Alagille syndrome, which should now be thought of as a proximal–distal polarization defect that occurs during kidney development. Because Notch signaling can be used to induce or suppress a structural option as many times as needed during organogenesis, additional roles for Notch signaling during nephron patterning are likely (we use this language to dissuade the reader from thinking that Notch only maintains stem or progenitor cells or promotes proliferation). Notch can have an impact on any biologic process in a context-dependent manner. For example, Notch signaling is required to suppress multiciliated cells that are interspersed among transporting cells within the zebrafish pronephros.33 Blocking the Notch signaling pathway results in conversion of transporting epithelial cells into multiciliated cells. Similarly, different cell types are intermingled in the mature mammalian nephron, particularly in the collecting system, where principal cells that transport water are interspersed with intercalated cells. Notch signaling may have an impact on the distribution of these cells as well. Although Notch has an impact on proximal–distal nephron specification via RBP-J in mouse kidney,16 the transcriptional targets of the Notch–RBP-J complex are unclear. Some insight into this issue is emerging from studies in lower vertebrates. The pronephros, mesonephros, and metanephros all share the nephron as their functional unit, although they vary greatly in their organization and number of nephrons. The pronephros, the functional embryonic kidney in amphibians and fish, consists of three defined segments: The glomus, where blood is filtered; the proximal tubule, where selective resorption of filtrate occurs; and the distal nephric duct, which ushers waste out of the organism. The molecular basis for the proximal–distal nephron segmentation is just beginning to emerge. As summarized in Figure 2, the early renal vesicle first divides into broad proximal and distal domains and then into the glomerular, proximal, and distal tubular segments. These are morphologically evident in the S-shaped body. This specification occurs as a sequential process involving multiple genes and signaling pathways. 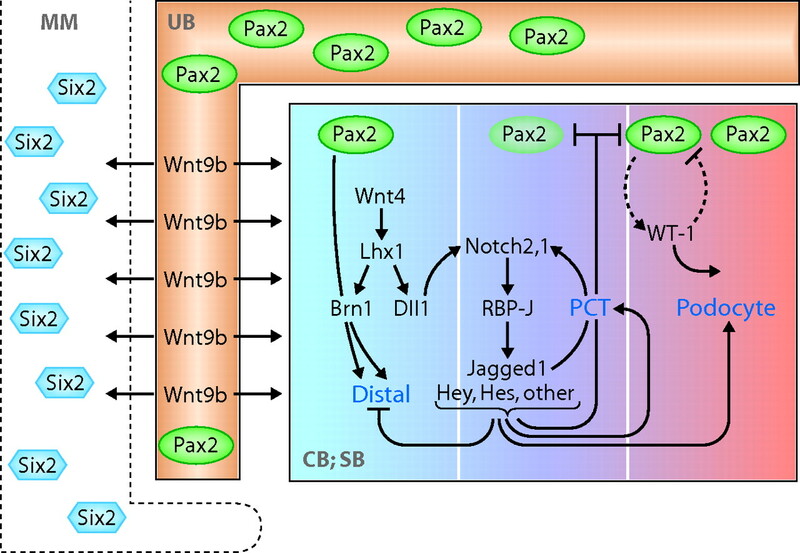 Pax2 and Pax8 may facilitate the formation of active chromatin through their interactions with Pax transactivation-domain interacting protein41. Wnt9b and Six2 (most likely with additional co-modulators) position the renal vesicle to the proximal aspect of the ureteric bud; Wnt4/FGF8 may activate Lhx1 in the distal domain of the renal vesicle, where Lhx1 activates Brn1 and Dll1. Dll1 initiates Notch2 activation, which amplifies its own signal by activating the ligand Jag1, producing a proliferative burst in the midsection of the renal vesicle and contributing to S-shaped body formation. A model for the molecular circuitry that is involved in segmenting the nephron. Pax2, Lhx1, and Brn1 are involved in establishing the distal segment; Notch2 is required to fix the proximal identities and to establish proximal precursors. MM, metanephric mesenchyme; UB, ureteric bud; CB, comma-shaped bodies; SB, S-shaped bodies, PCT, proximal convoluted tubules. See text for details. Notch activation during a critical window of development, preceding S-shape body formation, is required for fixation of a proximal identity. This event is subdivided further into podocyte precursors that lose Notch activity, perhaps as a result of an increase in the Notch antagonist COUP-TFII,42 whereas Notch continues to promote the establishment of proximal precursors. Although not much is known about specific factors that are required for podocyte determination within the early S-shape body, the three-nephron segment identities are stable by the time the S-shaped body is visible and no longer require Notch or Wnt to generate a morphologically recognizable nephron. Further development of S-shaped bodies requires proximal specification by WT-1.43 The proximal–distal nephron polarity mutants described in this review (Lhx1, Brn1, and Notch2) are valuable starting points that will lead to further identification of downstream components in the polarity program. R.K. and Washington University may receive income based on a license of Notch-related technology by the university to Merck. Merck did not support this work. This work was supported by a grant from the National Institutes of Health (DK066408). We thank Drs. Jeff Miner, Scott Boyle, Andy McMahon, and Jordan Kreidberg for commenting on the manuscript. Growing New Kidneys from Embryonic Cell Suspensions: Fantasy or Reality?